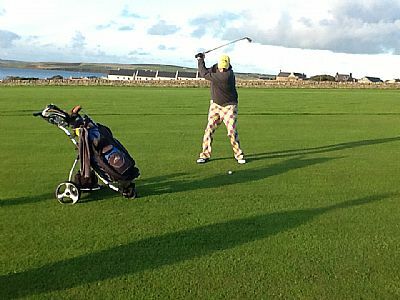 19 golfers turned up to play the first of this 2 part competition on what can only be described as a glorious Orkney mid summer evening. The sun shone and the wind eased as the evening progressed. That said the scoring, however, was a mixed bag yet again proving that our course is a constant challenge even for seasoned veterans. Amid the cries of Fore, as wayward shot's came from all directions and some inevitably found the all to present ditches, one player suffered what can only be described as a John Cleese moment (think Fawlty Towers, car and tree branch) and gave his trolley a damn good thrashing!!! It is now an Ex Trolley! In the end Derek Ward posted a 65 Nett, to lead into the 2nd day, with Bill Banks and Keith Nicol on 67’s, Martin Wick on 68 and Ben Lacy-Brown following on with a 69 and the rest of the field in the 70’s. So it’s all to play for in round 2. 13 golfers turned up on a very windy and overcast morning for the 2nd and final round of this year’s Club championship. The strength and direction of the wind certainly caused some problems with the 4th/13th and 8th/17th holes playing very long into it. This led to some high scoring with no player managing a par at the 4th, 8th or 13th and Erik Donaldson being the only player to par the 17th. 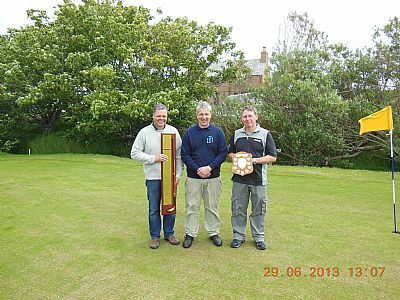 In the end only Bill Banks and Keith Nicol managed to break the Nett 70 barrier with 69 and 66 respectively. Summing up the 2 days of golf Erik Donaldson won the Gross competition with a 78/82 and Keith Nicol won the Nett with 67/66. This fun competition was played on Sunday 4th August with enough players for 4 teams with a junior in each group. 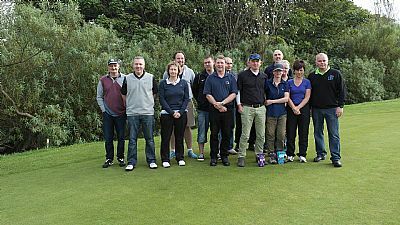 The teams and scores were as follows Gary Drever,Billy Scott and Emma Henderson on 60,Stuart Barnett ,Liz Pirie,Ian Barnett and Glen Scott on 58. In second place was David Henderson,Kenny Scott and Alex Henderson on 57, just one shot adrift of the winners Erik Donaldson,Ken Brookman and Robbie Scott on 56 shots. Great fun on a lovely afternoon for golf. Last weekend saw the final round of the summer league and it was the weather that won. Terrible conditions meant that no won played and so the league table remained unchanged with Erik Donaldson comfortably out in the lead as he has been for some weeks now. So with that the winner of the inaugural summer league is Erik Donaldson with 397, Derek Ward finished in 2nd place on 412 with David Henderson 3rd on 418. Well done to Erik and to all who played and we look forward to next years league. It has to be said that the 9 hole Thursday evening Stableford sweeps have been a great success with a good turnout most weeks. Thursday 5th Sept was the last evening of play and 12 players turned out on a glorious evening to try one last time to better their positions in the Eclectic league table, this has been an interseting first run of this competition and the top slots have been changing continually. The winner of the first Eclectic on 29 points was Gary Drever who only just managed to take it from Stuart Barnett, also on 29,on count back with Keith Nicol in 3rd on 28. This has been a very enjoyable competition and I'm sure will be very popular next year. 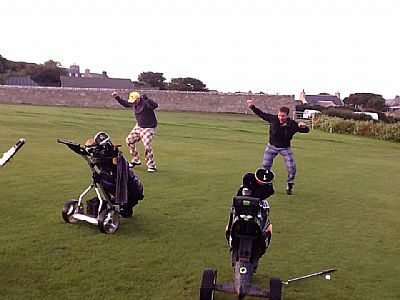 Today, Sunday the 8th September, saw with the exception of the re-scheduled Medals our final competition of the summer season with our Crazzzzzy golf. On a lovely warm day with some sunny spells 14 golfers, including 4 Ladies, turned up to pit their wits against a challenging wee layout. After handicaps had been sorted out and the course layout explained, as best I could , off they went confused by my description of the Texas scramble type format that I thought sounded plain enough but some couldn’t grasp but then maybe it’s my fading Doric accent that made it sound like gobbledygook! Or maybe I just explained it wrong . 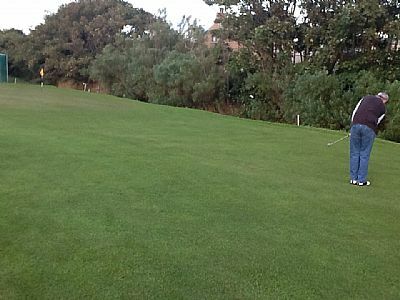 The course involved 2 totally blind holes in the form of the 5th tee to the 1st green and the 7th tee to the 5th green. Both of which were obscured by our now very large tree plantations. There were tricky wee short ones like the 3rd tee to the 4th green and the 7th tee to the 2nd green and the practice mat to the putting green. The 2nd to the 8th was slightly blind sighted and had the menacing burn front and back and Listers hole waiting to catch you out. From the new 1/10th tee there was an awkward shot to the 6th green and to cap it all. The 6th tee to the 9th green a dogleg right over trees, bushes, burns and out of bounds to a blind green. 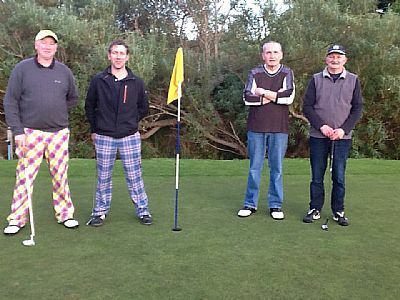 All in all a very challenging course and something none of us are used too even with some of the wayward shorts that can be played! Once all players return and scores and discrepancies were ironed out, to the best of our abilities, the winners were announced and it turned out to be Husband and wife Neil and Lorna Gauld, who were in different groups so no collusion there but maybe they understood me better than the rest??? Well done to you both and to thank you to all who made the effort to participate. It seemed that everyone enjoyed the afternoon and a few reckoned the course should have been played twice and that this would be a good mid-summer fun competition for the longest day?? This year’s match-play doubles final was completed tonight (Saturday 14th) with victory going to Derek Ward and Graham Reid by a narrow one hole margin over Jim Bews and Craig McPherson .In a match played in perfect conditions, the golf matching the weather, with never more than 2 shots in it. Craig and Jim won the 17th to take it down the last but a fine recovery shot by Derek from the side of the 9th green ensured a half and the one shot win. I'm lost for words but I'm glad I didn't witness it live! The final of the singles was played today,29th Sept, in fairly good conditions with a stiffening breeze. Young Ciaran Drever, who I may add has done very well to get to the final in his first real season of golf, had a almighty challenge on his hands playing the Legend that is Benny Thomson. But youth did not prevail and Ciaran succumbed to Benny's experience, or was it that he lost the will to play after having to listen to Benny's jokes and story's for all of the front 9, that can drain a body of all it's drive, and ultimately lost the match. Never mind Ciaran you did well and congratulations to Benny on his win.